The imbrication of digital and analog environments is bringing us to a revolutionary information crossroads. In the first two posts in this series, I examined the connection between information architecture and user interface design, and then looked closely at the opportunities and constraints inherent in information architecture as we’ve learned to practice it on the web. Here, I outline strategies and tactics that may help us think through these constraints and that may in turn help us lay the groundwork for an information architecture practice tailored and responsive to our increasingly connected physical environments. NYU Media, Culture, and Communication professor Alexander Galloway examines the cultural and political impact of the Internet by tracing its history back to its postwar origins. Built on a distributed information model, “the Internet can survive [nuclear] attacks not because it is stronger than the opposition, but precisely because it is weaker. The Internet has a different diagram than a nuclear attack does; it is in a different shape.” For Galloway, the global distributed network trumped the most powerful weapon built to date not by being more powerful, but by usurping its assumptions about where power lies. As we begin to design for the Internet of Things, we'll need to expand our IA approach — and our toolbox. In an earlier post in this series, I examined the articulatory relationship between information architecture and user interface design, and argued that the tools that have emerged for constructing information architectures on the web will only get us so far when it comes to expressing information systems across diverse digital touchpoints. Here, I want to look more closely at these traditional web IA tools in order to tease out two things: (1) ways we might rely on these tools moving forward, and (2) ways we’ll need to expand our approach to IA as we design for the Internet of Things. 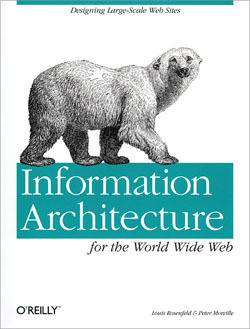 First published in 1998, The Polar Bear Book gave a name and a clear, effective methodology to a set of practices many designers and developers working on the web had already begun to encounter. Morville and Rosenfeld are both trained as professional librarians and were able to draw on this time-tested field in order to sort through many of the new information challenges coming out of the rapidly expanding web. Emerging IoT technologies require a carefully considered approach to integration, implementation, and user interface. Just when it seems we’re starting to get our heads around the mobile revolution, another design challenge has risen up fiercer and larger right behind it: the Internet of Things. The rise in popularity of “wearables” and the growing activity around NFC and Bluetooth LE technologies are pushing the Internet of Things increasingly closer to the mainstream consumer market. Just as some challenges of mobile computing were pointedly addressed by responsive web design and adaptive content, we must carefully evaluate our approach to integration, implementation, and interface in this emerging context if we hope to see it become an enriching part people’s daily lives (and not just another source of anger and frustration).